The Witches, a game by Martin Wallace, was published in 2013 so I may be a little late to the party with this review, but I feel like this game is somewhat underrated. 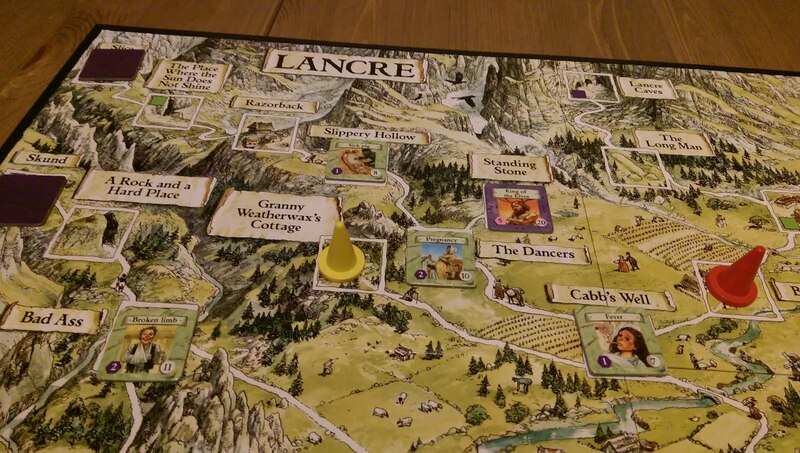 As something that I will almost always suggest to play whenever we have a gaming session with 3 or 4 people I wanted to put my thoughts about it down in writing. 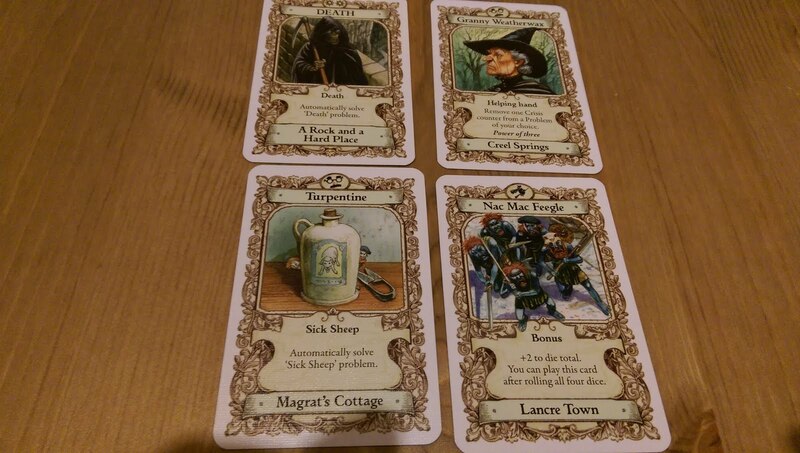 So what type of game is The Witches? Well, it plays very similar to a lot of co-op games, ones by Matt Leacock, and Pandemic especially. A player’s turn will involve moving about the world taking some actions, and using cards from their hand, to try and calm down the state of the board. In the case of The Witches you are solving the people of Lancre’s problems, be it a sick animal, a pregnancy*, or a more sinister problem like an invasion for some tricksy elves. After each player’s turn a new problem will arise, and like its counterparts there are a few conditions that will cause everyone to lose the game together. I know you are thinking: “Yes Glen we know how co-op games work” right? Well here’s the thing, I never said it was a co-op game. Indeed, The Witches is actually a competitive game where each player is trying to be the best witch by solving the most, or hardest problems. 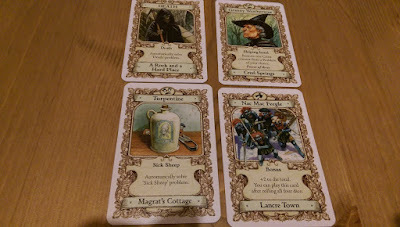 This is very thematic as it captures the attitudes of the witches of the Discword, but it’s also very interesting as a game. I enjoy the mechanics of co-op games, the ever increasing disastrous state of the world, and the fact the whole thing could explode if you don’t work to mitigate the fail conditions whilst trying to achieve the victory, but they can be prone to alpha gaming (by me), or feeling like there’s only one path to take. When sometimes the path to a group victory involves one player being a zombie slaying God and another staying home and emptying the bins, it’s a fun change of pace to have every player wanting to be the one that banishes the king of the elves. While they are all fighting to do this, however, the one sick pig they all ignored has escalated, there’s now a whole pen of sick pigs, four pregnant women in desperate need of your expert midwifery skills and possibly a vampire that's getting a few too many ideas above it’s station. So everyone wants to be the best but they all need to make sure the world isn’t overrun by elves and that they don’t run out of crisis tokens, because it’s game over for everyone. Oh! and of course don’t forget to have tea with each other once in a while because all that magic slowly makes you go a bit funny and going too far towards becoming a cackling witch will permanently damage your reputation with negative victory points. The location name is used when determining where to add the next problem, and if the location already has a problem it will gain a crisis token that makes the problem harder to solve. Since a problem MUST be placed every turn you keep doing this until you get an empty location, this can mean that if you don’t keep emptying spaces crisis can chain together quite fast and of course you all lose if there’s no crisis tokens to place. The broomstick symbols are used to fly anywhere on the board instead of the normal walk between connected locations, and the Headology and Magic symbols are used when solving problems, each problem will have a difficulty you are trying to reach by rolling dice and using cards, discarding a card with Headology adds 1 to your result while Magic adds 2, but also gives you a cackle counter. “Wait what! You have to roll dice?” …. Yes, but, it’s fine. The early problems have difficulties of 6-10 or so and you are rolling four six sided dice to try and get that total, and as you solve easy problems you increase your hand size to allow you to tackle hard problems with more cards to add to your score. Solving hard problems gives you a passive increase to you problem solving ability so you can try and work up to taking on the hardest of the hard problems. So there is character progression in this game, as you solve problems you get better at solving problems so the early game often sees players chasing the easiest, lowest scoring problems to prepare themselves for what’s to come. However you could hoard a few good cards and then plough into a hard problem early on, yielding more victory points, but of course you are more likely to fail, so there’s also a risk / reward element to the problem solving. 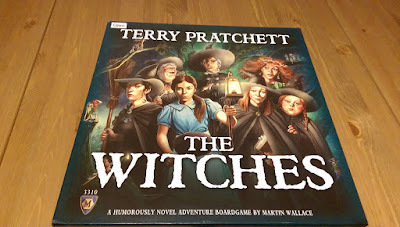 I wouldn’t claim there’s anything groundbreaking in The Witches, it’s a faux-op game that i’d recommend to people that like Pandemic and especially if you are a Discworld fan. I do wonder if the theme is more of a hindrance than not for the game. Is anyone that’s not a Discworld fan really going to buy this? And if they do, the Tiffany Aching set of novels that the game is based around are aimed at a younger audience than the rest of the series, so even among fans these characters might not be familiar. Perhaps if it was re-skinned to be set in an office where each player needs the company to stay afloat, but they also need to be the most respected employee it would have a bigger following? * Read what you will into the “solving” of a pregnancy.